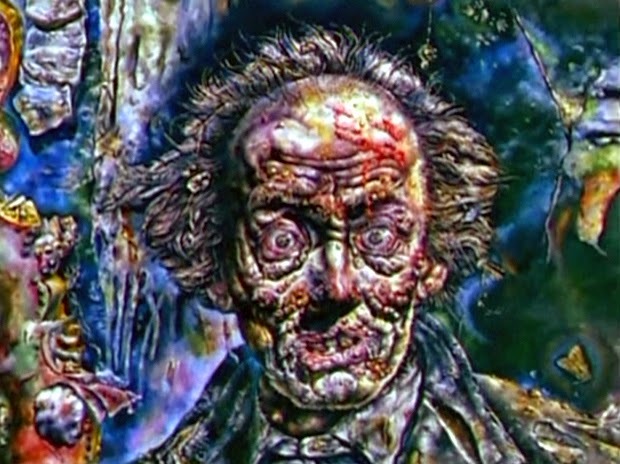 It’s Day 9 of 31 Days of Horror and we’re talking about The Picture of Dorian Gray from 1945. I’m sure it would pain Mark to know this, but I must confess that I have never read the book by Oscar Wilde. I’m sure it would also pain Kelley to know this, but I must confess that I have never seen any cinematic adaptation of it, of which there have been quite a few. Now, that doesn’t mean I’m completely ignorant of the subject. This particular piece of literature has become so ingrained in pop culture that it was even used a punch line to insult Meg on Family Guy (When she asks how she looks in her new glasses, Stewie tells her, “In an attic somewhere, there’s a portrait of you getting prettier.”) but it does mean that right upfront, you should know that I have no idea this version compares to the book or if it’s better or worse than other Dorian Gray movie, but having said all of that, I loved this movie. That’s all longwinded to be sure, but yes, I really did love this movie. So, for those that don’t know the plot, it is set in London during the late 1800s, and is about a young man named Dorian Gray (played by Hurd Hatfield) who is having his portrait done. He muses that he wishes his portrait could age instead of him, and thanks to an Egyptian cat sculpture, Gray’s wish comes true. But this is a horror film, after all, so there has to be a catch, right? Of course there does!! And this particular catch is that Gray’s inner ugliness will be exposed through the portrait itself, as the portrait changes over time instead of Gray, who completely stops aging. Those around him find this disconcerting to say the least, and it ultimately isolates him and drives him mad. Lord Henry Wotton (George Sanders, who I always best remember as the voice of Shere Kahn in The Jungle Book) plays a sort of devilish character who talks Gray into living life to the fullest and giving in to his wildest dreams and desires. 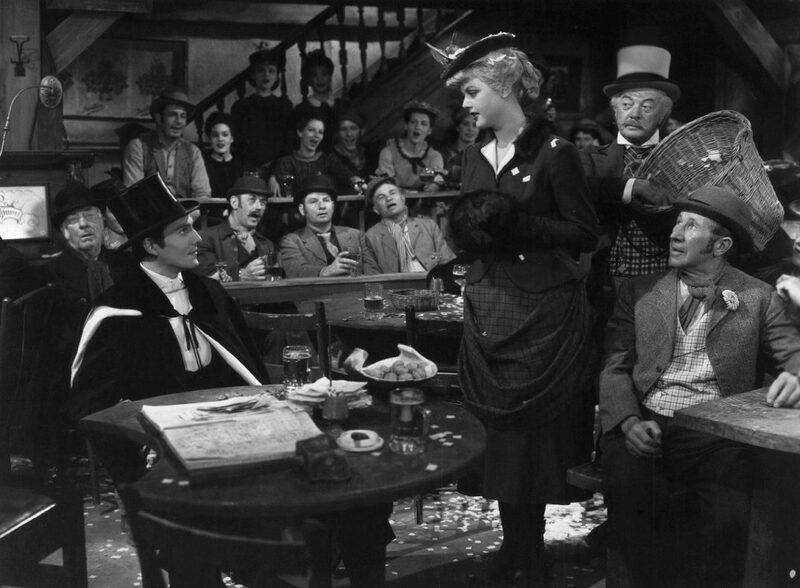 It’s through Lord Wotton’s advice that Gray passes on the opportunity to be with Sibyl Vane (a VERY young Angela Lansbury), a singer that he falls in love with early on. His rejection causes her to commit suicide, and this is the point of no return for Mr. Gray. After that, it’s vague as to what exactly he does that is so horrible in his life (aside from the onscreen murder, of course), but I rather like that aspect of the story. It’s almost a mirror to the audience, asking us to imagine our worst qualities and our worst actions and what it would be like to have a painting displaying them for all the world to see. Perhaps you’d cover it up just as he does, but would that ever be enough? It still exists. The psychosis on display feels gradual and thus, natural. It’s handled extremely well. I also particularly love the cinematography of this film. It’s a black and white film, but a select few shots of the portrait are in full technicolor and they are GORGEOUS!! They’re also extremely jarring, which is perfect for a horror movie, and can be used to shocking effect in what otherwise might have fallen flat. It also helps that the portrait itself is growing more and more hideous each time it is revealed. But more than just the few color inserts, I enjoyed the stylized cinematography during the first murder scene, with the hanging light swinging violently, creating intense chaos in a dance of light and shadows on the walls. It’s beautiful and creepy and I love it. And that encapsulates my feelings about this movie. If you haven’t seen it, go check it out!! So I’m closing out the 1940s, but for Day 10 tomorrow, Kelley will be reviewing the 1953 movie It Came from Outer Space, so come on by and check it out! !